Following the publication of Parts 1-4 of this project, we received many requests to expand our coverage to cover the writings of a number of key women writers. Sarah and Samuel Adams: The complete servant; being a practical guide to the peculiar duties and business of all descriptions of servants (1825). Isabella Mary Beeton: How to manage house and servants, and make the most of your means (1866-67), Beeton’s penny cookery book (c1870), The management of children in health and sickness (1873) and 7 other titles. Elizabeth Blackwell: The laws of life, with special reference to the physical education of girls (1859) and 4 other titles. Frances Power Cobbe: The sick in the workhouses (1861); Essays on the pursuits of women (1863) and 12 other titles. Sarah Stickney Ellis: The women of England, and their social duties, and domestic habits (1839) and 12 other titles. Harriet Martineau: Household education (1849) and 2 other titles. Charlotte Mary Yonge: The young step-mother; or, a chronicle of mistakes. (1861) and 6 other titles. 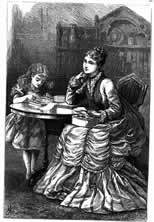 There are also writings by Lydia Maria Child, Hester Chapone, Dinah Mulock Craik, Charlotte Perkins Gilman, Lydia Sigourney and Harriet Beecher-Stowe.